The UN declared food security as a global issue in 1974. While we realize that this fundamental need is still a scarcity in developing countries, it amazes most people that food security can be a real challenge for nations such as the United Arab Emirates. Widespread desertification, decreasing rainfall, and fast diminishing ground water reserves have pushed Dubai to import as much as 99% of its food requirements. Born after 18 months of intensive studies and research, the recently launched ‘Open Food Platform’ aspires for Dubai to not just be self-sufficient, but be the food hub of the region and the world. 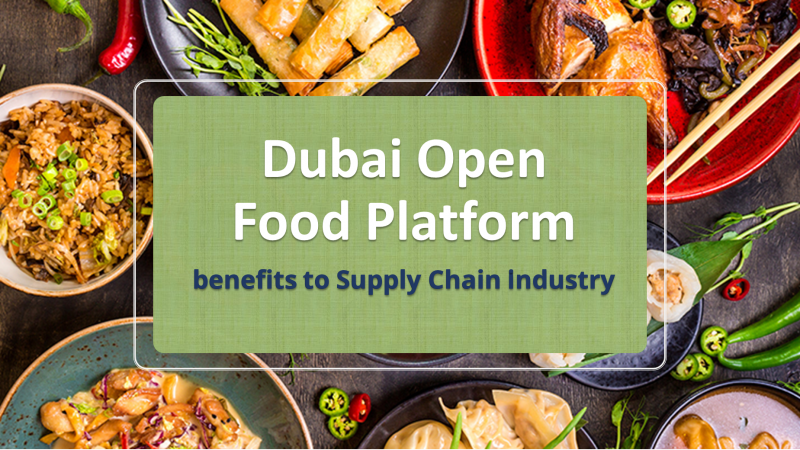 The Open Food platform is the brainchild of Dubai Exports in collaboration with a consortium known as the FBMG or Food and Beverage Manufacturing Business Group. The platform basically provides a digital forum which integrates various stakeholders in the food value chain, who transact business and share information across a smart platform, thereby generating increased transparency and ensuring efficiencies in the food supply chain. Within a short span, the platform has already on boarded over 650 companies and investors, as well as 4000+ traders who are associated in some form or the other with the food ecosystem. This Open Food platform is built around upcoming smart technologies such as Blockchain and AI, which have been successfully applied in the logistics domain. These technologies will enable the platform to record immense amounts of data which can be harnessed by all stakeholders. By having access to more accurate forecasts of Food Supply and Demand logistics providers will be able to optimally design, and invest in their infrastructure and supply chain networks at the best cost and efficiencies. These efficiencies will further cascade to the end consumers by eliminating wasteful expenditure, or wastage of food. As Dubai is the gateway port to the Middle East, Africa, and parts of Europe; significant volumes of food and agro commodities are re-exported from here. Logistics providers and businesses will now be able to facilitate food availability to these geographies, in a time and cost effective manner, by utilizing data on Dubai’s re-export volumes from the Open Food Platform. With the right adoption and implementation, the Open Food Platform will serve multiple objectives. Dubai’s Import/Export volumes and logistics business will boom, it will deepen its expertise in Block Chain Applications, provide a model concept which can be replicated by other nations, and most importantly – it will propel the world by many steps forward in resolving the Food Scarcity challenge.